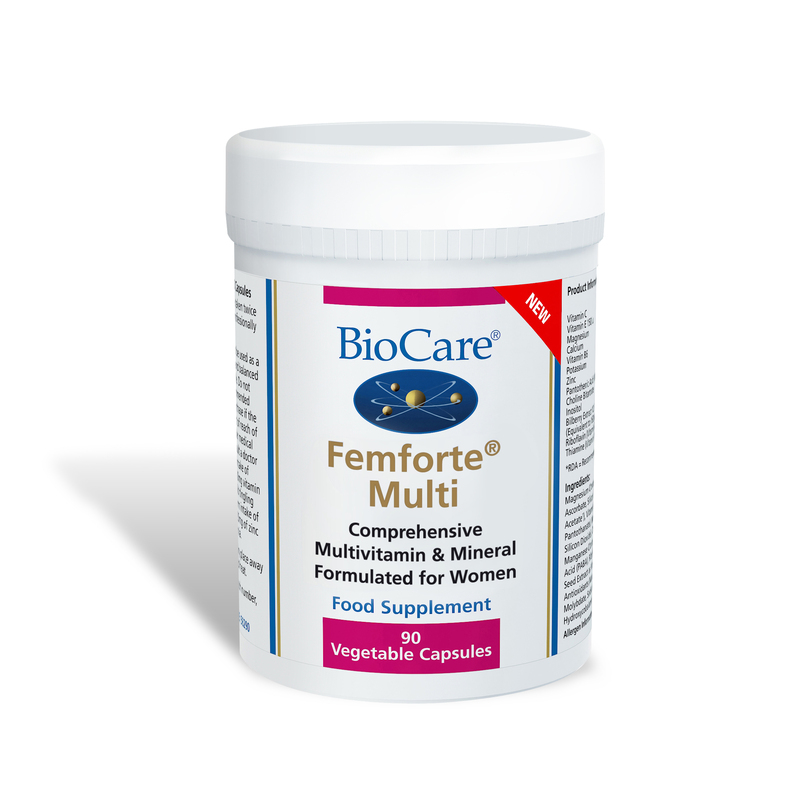 BioCare FemForte Multi is a comprehensive, high potency multivitamin, mineral and antioxidant complex health supplement, particularly suited to the special requirements of women. It contains high ratios of nutrients supportive of female health. Femforte Multi is a new formulation in line with current research. It replaces FemForte I & II and contains increased levels of magnesium, iodine and vitamins B6 & D, now also contains green tea. Suitable to support women of childbearing age. 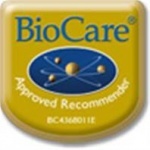 Provides nutrients in their most bio-available form for optimum absorption. Vitamin A, C and D contribute to the normal function of the immune system. Magnesium Citrate, Vitamin C (as Magnesium Ascorbate), Calcium Citrate, Potassium Citrate, Zinc Ascorbate, Capsule Shell (Hydroxypropyl Methylcellulose), Vitamin E (as D-Alpha Tocopheryl Succinate),, Vitamin B6 (as Pyridoxal-5-Phosphate), Choline Bitartrate, Iron Citrate, Pantothenic Acid (as Calcium Pantothenate), Niacin (as Nicotinamide), Corn Starch, Inositol, Thiamine (as Thiamine Hydrochloride), Dicalcium Phosphate ,, Riboflavin, Manganese Citrate, Bulking Agent (Cellulose)PABA (Para Amino Benzoic Acid), Olive Oil , Anti-Caking Agents (Magnesium Stearate), Microcrystalline Cellulose , Green Tea Extract (as (Camellia sinensis Leaf),, Modified Tapioca Starch , Beta Carotene , Sunflower Oil, Chromium Picolinate, Acacia Gum, Sucrose, Copper Gluconate, Vitamin A (as Retinyl Palmitate), Antioxidants (Natural Mixed Tocopherols, Ascorbic Acid & Ascorbyl Palmitate),, Folic Acid, Sodium Molybdate, Potassium Iodide , Vitamin D (as Ergocalciferol), L-Selenomethionine, Sodium Borate, Biotin, Vitamin B12 (as Hydroxycobalamin).